DIMENSIONS: 53 L x 29 W x 28 H inches; Interior storage dimensions: 52 L x 26 W x 22.75 H inches. Seat width: four feet. DECK BOX - features oversized storage, all-weather construction, hassle-free maintenance and a handy extra loveseat. vailable in neutral, light taupe to suit any outdoor space, this storage unit can be loaded up with up to 400 lbs of garden tools, outdoor gear and snow-day necessities. 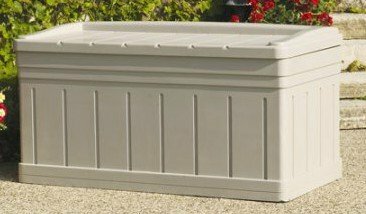 PATIO STORAGE - This storage box is constructed of heavy-duty resin and features 129 gallons of storage space, along with a convenient, removable storage tray. It has a stay-dry design will help keep it safe and protected from water-damage, through endless summers and snowy winters. View More In Outdoor Storage. If you have any questions about this product by Deck Box, contact us by completing and submitting the form below. If you are looking for a specif part number, please include it with your message.